The book that revolutionized the theory and practice of educational change is now in its Fifth Edition! Michael Fullan’s The New Meaning of Educational Change is the definitive textbook on the study of educational change. Based on practical and fundamental work with education systems in several countries, the text captured the dilemmas and leading ideas for successful large-scale systemic reform. This updated edition includes decision-makers at all levels — from the local school community to the state and national level — and introduces many new and powerful ideas for formulating strategies and implementing solutions that will improve educational systems. Develop collaborative cultures at the school level, while avoiding superficial versions of professional learning communities. Foster district-wide success in all schools, illustrating how state and national systems can achieve total system transformation based on identifying and fostering meaning for educators at every level. Integrate individual and systemic success, a rare feat in today’s school reform efforts. The New Meaning of Educational Change, Fifth Edition is your comprehensive textbook on all aspects of the management of educational change — a powerful resource for everyone involved in school reform. 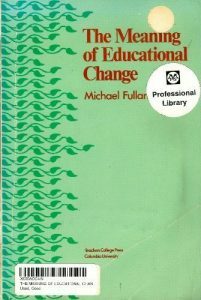 When Michael Fullan published the first edition of this seminal work in 1982, he revolutionized the theory and practice of education reform. Now, a quarter of a century later, his new fourth edition promises to be equally influential for radical reform in the 21st century. The New Meaning of Educational Change (4th ed.) is your definitive compendium to all aspects of the management of educational change — a powerful resource for everyone involved in school reform. The New Meaning of Educational Change (3rd ed.) provides the definitive up-to-date reference for the educational innovator in the new millennium. It provides powerful insights into the complexity of reform and recommends inspiring and practical strategies for lasting improvement. Written in clear, accessible language, it provides a classic guide to reform.